Small enough to fit into the palm of your hand, with enormous eyes and an appetite for meat, tarsiers are an anomaly of nature. They are also our distant cousins, according to scientists at Washington University School of Medicine in St. Louis, who recently sequenced and analyzed the tarsier genome. The findings, published Oct. 6 in Nature Communications, place tarsiers on an important branch of the primate evolutionary tree – along the same branch that leads to monkeys, great apes and humans. "We sequenced the tarsier not only to determine where they fit in primate evolution, but because their physiology, anatomy and feeding behavior are very unique," said Wesley Warren, PhD, an associate professor of genetics and the study's senior author. Tarsiers are the only exclusively carnivorous primate, eating insects and small birds, rodents and lizards. With eyes twice as big as their brains, a head that can rotate 180 degrees in each direction and the ability to track prey using ultrasound, the tiny animals are formidable nocturnal hunters. Their legs and feet are adapted for sudden, powerful leaps, with an elongated ankle bone, the tarsus, for which they are named. The position of tarsiers among primates has been considered controversial. Their teeth and jaws are more similar to "wet-nosed" primates such as lemurs, but their eyes and noses are more similar to "dry-nosed" primates such as monkeys and humans. By sequencing the complete genome of a tarsier, Warren, Jürgen Schmitz of the University of Münster in Germany, and colleagues definitively placed tarsiers in the dry-nosed category. The researchers analyzed DNA sequences known as transposons, or "jumping genes," which can jump from one part of the genome to another, often duplicating themselves in the process. Over time, transposons lose the ability to jump. Newer transposons can jump into older transposons, but not vice versa. By analyzing which transposons were embedded inside others, the researchers were able to determine when particular families of transposons lost the ability to jump and thereby date the different families of transposons. The researchers compared the transposon families of tarsiers, humans, bushbabies (a wet-nosed primate) and squirrel monkeys (a dry-nosed primate). Tarsiers shared more recent transposon families with squirrel monkeys and humans, and only the oldest ones with bushbabies, indicating that tarsiers belong with the dry-nosed primates. "Jumping genes help us understand how species diverged from one another over millions of years ago," Schmitz said. 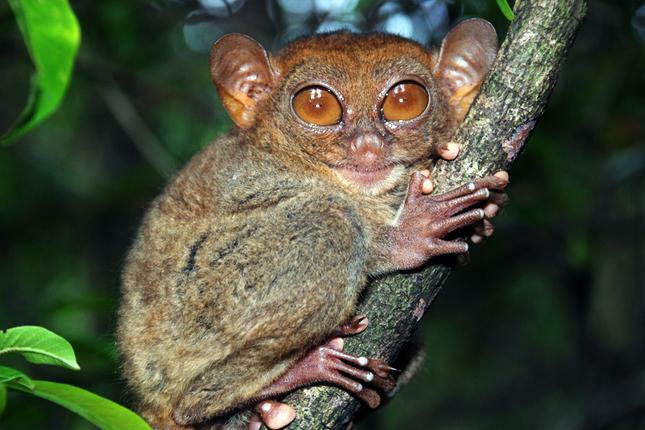 "The tarsier genome is a modern archive of evolutionary changes that led to humans." Having the complete tarsier genome also allowed the researchers to comprehensively study the genes that make tarsiers unique. Since, for example, the tarsiers' eyes and ankle bones differ so much from those of other primates, the genes associated with eye or bone growth and development are likely to differ as well. By comparing gene sequences from tarsiers with those from other primates, the researchers identified 192 genes that are changing faster or slower than what is happening in other primates. These genes likely are linked to the tarsiers' unusual traits. They then scanned the scientific literature to identify human diseases associated with those genes and found 47 diseases. About a quarter were related to vision and another quarter to musculoskeletal problems. "The tarsier genes that display unique alterations can give us a clue into human diseases involving the same genes," Warren said. "If an amino acid has been uniquely changed and it is putatively associated with the tarsier's novel musculature, maybe it's an important part of the protein and worthy of a closer look when linked to human disease." Analysis of the tarsier genome also showed that these fascinating animals are displaying signs of population decline. "We think the population size is declining and not rebounding," Warren said. "Most of the decline is due to loss of habitat, but the pet trade also is contributing. Once captured, sadly, the result is often death due to physical and dietary needs not being met. It's possible that some tarsier species will go extinct if we don't change these trajectories." The researchers are hoping to obtain DNA from other tarsier species and populations, which they plan to use to assess the health of the tarsier population, among other studies. "If we can sequence the genome of other tarsiers, we can measure the population diversity. A population with a greater amount of diversity should be more capable of surviving changes in its environment," Warren said. "It will help us determine how endangered they really are so we can implement measures to better protect them."